4. Saute the vegetables except the tomatoes in the olive oil in small batches. 9. Crush the garlic and add to the tomatoes. Add the sugar, salt and pepper to taste and simmer for another minute. 10. 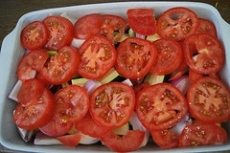 Pour the tomato sauce on top of the vegetables and bake at 350 degrees F or until the vegetables are tender. 11. Serve with plenty of fresh bread and, if you like, some feta cheese on the side.